THE WORLD IS NOT ENOUGH – If you and yours are still reeling from last week’s shocking presidential election results, trust me, you’re not alone. A night hasn’t gone by since Donald Trump was declared the next president of the United States when thousands of people have taken to the streets of various American cities, expressing their profound disgust and discontent with the outcome. Obviously those protests can’t last ever, at least not in that form. But clearly America’s worst nightmare has come true in the form of a deeply unhinged, power hungry ego-maniac who, at the age of 70, has achieved his greatest quest beyond riches and fame. More power than he ever dreamed of having. It is a critical civics lesson for all of us to make note of. It doesn’t take much to capture the hearts and minds of those who were always raised to believe that they’re not sittin’ pretty as God intended just because the government is taking care of different folks who are not worthy. Doesn’t take much at all to convince folks that their place in the world, let alone their country, is no longer on cherished ground because their kind is no longer in charge. Mix a little religious bigotry in there, add a healthy handful of racial bias, a shovel full of sexism, wrap it all up in an American flag, and voila – something Joe and Jane Sixpack have been hankering for. I know, I know, there I go, one of those high-minded liberal “elites” making fun of the “real” Americans who “cling to their guns and Bibles.” Heck, the only thing “elitist” about me are the bubbles that spring out of my glass of ginger ale…on the rocks. Otherwise, I’m no more elitist than the school crossing guard up the block. But I do consider myself intelligent enough to know a mass flim-flam game when I see one, and I saw a sure ‘nough big one last week. Over 60 million Americans, frustrated with whatever hardships life has dealt them not because groups of foreign color folk have taken their jobs, but because rich industrialists like Donald Trump have taken their jobs and shipped them overseas where the costs, and the salaries, are ten cents on the dollar. Then these same greedy pigs pay off politicians to keep the working class divided by race and class, angrily pointing ay each other as the reason they just can’t make ends meet for their families. No less than Sen. Bernie Sanders figured this out, and developed a strong national following during the Democratic presidential primaries. Problem was as good as Bernie was at pointing out the problems at their source, when you asked for a plan to deal with the situation at the source, he didn’t have one. You know, he’s like that guy from the commercials who is there only to tell you have a problem with termites in your home, but is not there to do anything about it. That’s the tragic realization many a Trump supporter is going to arrive at. This guy promised lots of action, but is not going to be able to deliver on anything that will make the lives of the little people he suckered any better in the long run. Trump was slick enough to get folks to vote against their own self interests, under the guise that they would be sticking it to “Corrupt Hillary” and those lousy Democrats in the process. Who knows? This charade may last the full four years, maybe not. But one thing is for sure….it’s going to get a whole lot worse for everybody, before it gets better for anybody. Thanks to the drive and vision of a group of committed community leaders, an historical marker commemorating the legacy of the Wilmington Ten and their struggle against racism was unveiled earlier today near Gregory Congregational United Church of Christ on 609 Nun Street. The marker, approved by the Wilmington City Council and Commission on African-American History, is the culmination of events in recent years that led to the 2012 official pardoning of the ten civil rights activists- nine black males and one white female - who stood against racial bias in the New Hanover County Public School System after the force closing of all-black Williston Senior High School in 1968. The ten – the Rev. Benjamin Chavis, Jr.; Connie Tindall; Marvin "Chili" Patrick; Wayne Moore; Reginald Epps; Jerry Jacobs; James "Bun" McKoy; Willie Earl Vereen; William "Joe" Wright, Jr.; and Ann Shepard, were all falsely convicted in connection with the Feb. 1971 firebombing of a white-owned grocery store and subsequent sniper attack on police and firemen during citywide unrest, and sentenced to 282 years in prison. A worldwide movement saw the Ten labeled as “politcal prisoners” by Amnesty International, spurring marches and demonstrations across the globe as their case was repeatedly being appealed. Finally, in Dec. 1980, the US Fourth Circuit Court of Appeals vacated the state convictions against the Ten based on prosecutorial misconduct. Thirty-two years later, in an effort led by The Wilmington Journal, the National Newspaper Publishers Association, the NCNAACP and the Wilmington community, then NC Governor Beverly Perdue issued six pardons of innocence for the surviving members of the Wilmington Ten, and four certificates posthumously for the late Connie Tindall, Ann Shepard, Jerry Jacobs and William “Joe” Wright, Jr.
Today’ historical marker commemorates the courageous stand the city’s boycotting black students took as they sought sanctuary in Gregory Congregational Church during that first week in February 1971, only to be targeted by white supremacists who attacked the church to stop their cause. “I’ve been saying for quite some time that they needed soemthing that people could visualize about the movement which occurred at that time,” Karen Clay Beatty of the Friends Committee of the Wilmington Ten told The Journal. She had been pondering the idea of some kind of marker for some time, but decided over a year ago that the time had come to act, so Beatty began floating the idea in the community in order to build a base of support. Soon Beatty was urged to develop a proposal to present to the city, and she eventually enlisted the aid of local citizens, Wilmington Ten family members , and Class of 1971 alums from New Hanover High School and Hoggard High School. – all who later formed the Friends of the Wilmington Ten Committee. The proposal was presented to the Comission on African-American History, which, after several months, eventually presented the proposal to a city committee. Once reviewed, the proposal, with Councilman Dr. Earl Sheridan’s assisatnce, was ultimately presented to the Wilmington City Council for approval, which it was last July through resolution. If there was one undisputed Democratic winner from North Carolina’s Nov. 8th general election, it was Wake Superior Court Judge Mike Morgan, who unseated Republican Associate state Supreme Court Justice Robert Edmunds, 54 to 45.6 percent. Compared to many other marquee race results on the ballot election night, “resounding” is certainly an appropriate description of Justice-elect Morgan’s victory. According to final unofficial numbers in the Morgan-Edmunds race, the Democrat won with 2,134,015 votes statewide, bolstered by 1,383,585 One Stop early votes between Oct. 20-27, and 676,836 ballots on Election Day, as well as a number of mail-in absentee ballots and provisional votes. Justice Edmunds was over 300,000 votes short across all categories. Some observers have been particularly curious about how, and why Morgan was able to do so well against Edmunds, while every Democratic appellate court candidate, even the incumbents, fell to a Republican opponent. Unlike the Court of Appeals races, the NC Supreme Court race was not partisan labeled on the ballot, so neither Judge Morgan or Justice Edmunds were identified with their respective parties under their names. Some observers believe this was key because, in order to gain partisan advantage, GOP lawmakers determined that Republican candidates would be listed first in each partisan contest. With straight ticket balloting eliminated, all Republicans had to do was simply vote for the first name in every category on the ballot. But for some reason, Judge Morgan’s name, not Justice Edmunds’, was listed first in the non-partisan Supreme Court race, which may have caused some confusion with Republican voters not familiar with either candidate, resulting in the over 300,000-vote win for Morgan, some analysts, who called it “a mistake,” believe. Morgan also credits his campaign team for great organizing and establishing a good, “strong” social media presence. Justice Edmunds also found himself targeted by an outside progressive special interest group in a campaign television commercial called “the snake ad,” for writing the lead opinion upholding the Republican-led state legislature’s 2011 redistricting map that was later ruled unconstitutional by a panel of three-federal District Court judges last August for creating congressional voting districts by race. Edmunds did write that overturned 4-3 opinion, but maintained that the campaign ad suggesting that he was somehow racist because he did, were unfair. In the aftermath of Justice-elect Morgan’s election victory came reports that Republican legislative leadership, in a move to counter a Democratic Gov. Roy Cooper, is considering offsetting what would be a 4-3 Democrat majority on the state Supreme Court with Morgan’s addition, by appointing two additional, presumably Republican associate justices during the special session Gov. McCrory is planning to call for Hurricane Matthew disaster relief. The state Constitution allows for a total of nine justices to serve, which includes the chief justice. Justice-elect Morgan also wasn’t pleased. When told that many in North Carolina’s African-American community are proud of not only his election to the state’s High Court, Justice-elect Morgan said he was proud to be the first African-American to be elected to the state Supreme Court without first being appointed by a governor. 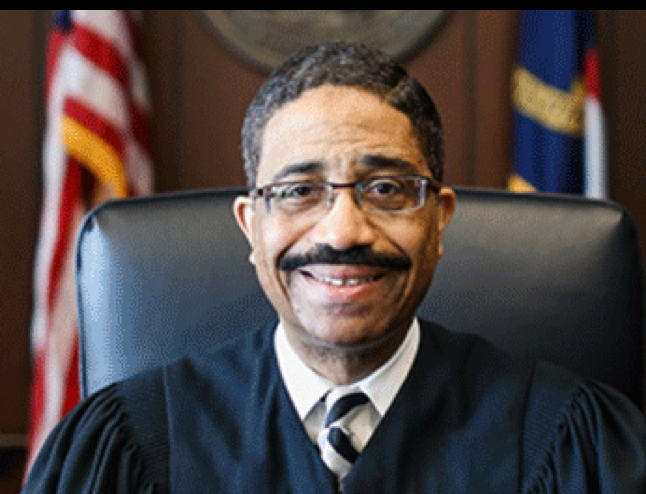 Morgan added that he is now the only African-American male on the High Court (Associate Justice Cheri Beasley is currently the only black female on the court). Justice-elect Mike Morgan will be sworn into office in January 2017. Most Democrats agree that the damage they suffered nationally and statewide after the 2016 general election cannot be underestimated. For black Democrats in North Carolina and Forsyth County, beyond the decisive victory of Wake Superior Court Judge Mike Morgan for the state Supreme Court, and Lynne Johnson, the first African-American elected as county Register of Deeds, there is particular consternation. With the 2018 congressional midterm elections the next electoral challenge, black Democrats say the lessons learned from the party’s poor showing should not be ignored. “The lack of African American enthusiasm and failure to turn out record levels, as in 2008 and 2012, lies with the lack of investment in the African American community from the Democratic National Committee (DNC), Democratic Congressional Campaign Committee (DCCC), National Governors Association (NGA), Democratic Senatorial Campaign Committee (DSCC) and Super PACs,” Wilkins-Daniels continued. Wilkins-Daniels continued that it was a mistake for party leaders to believe that African-Americans would automatically vote Democrat, instead of choosing to stay home this election, which many did. Saying that the American people “…sent a thunderous message that the system is rigged,” Pres. Wilkins-Daniels further charged that progressive Democrats have mistakenly invested as much as $200 million in other election priorities besides African-American voter mobilization. Wilkins-Daniels further charges that the Hillary Clinton presidential campaign failed to listen to grassroots workers who knew their communities better than most. [WINSTON-SALEM] After almost 20 years in prison, Kalvin Michael Smith was ordered released from prison last week after serving time for brutal beating and armed robbery he’s always maintained he did not commit. Smith, 45, was convicted of the 1995 assault on an assistant store manager and sent tp prison for 29 years. Experts have always maintained that the original police investigation was “sloppy” at best, and Smith said he wasn’t even in the neighborhood of the crime at the time. His new attorneys petitioned the court that Smith received ineffective counsel at the first trial, failing to introduce mitigating evidence during original sentencing that would have decidedly lowered his time behind bars. Based on a motion of time served, Smith was released last week. He is now proceeding to prove his innocence to clear his name. [CHARLOTTE] Keith Lamont Scott, the black man a Charlotte police officer fatally shot in the parking lot of an apartment complex in September, was shot once in the back, and in the abdomen, an autopsy reveals. Police say Scott had pulled a handgun, and ignored repeated police orders to drop it. Scott’s killing ignited several days of protest marches and some violence. [DURHAM] Amid charges that something was untoward with Durham County not counting over 90,000 votes on Election night that helped Democrat Roy Cooper to outpoint Republican Gov. Pat McCrory by almost 5,000 votes, the Republican chairman of the Durham County Board of Elections maintains that nothing wrong was done, and the late addition of the 90,000+ ballots was purely because a machine malfunction would not allow it to be any other way but manually. An attorney for the state GOP has filed a protest with the state Board of elections. The official canvass of all ballots in the state elections are scheduled to be finished on Friday, Nov. 18th. [BLADEN COUNTY] The re-election campaign of Gov. Pat McCrory has filed a formal complaint against a political action committee funded by the NC Democratic Party, alleging that hundreds of fraudulent absentee ballots were cast in Bladen County on behalf of Democratic gubernatorial candidate Roy Cooper and other Democratic candidates. Both the Cooper campaign and the NCDP deny any wrongdoing. The State Board of Elections is investigating. [RALEIGH] Gov. Pat McCrory is asking Congress for over $1 billion in disaster relief in the aftermath of Hurricane Matthew to help with recovery and repairs. According to the Governor’s office, over 30,000 businesses were impacted by massive flooding in several counties, along with $400 million in crop losses. Over 3700 people were moved to shelters, as 48 counties qualified for disaster relief. The economic losses total approximately $2 billion, the Governor’s Office adds. McCrory is expected to call a special session of the legislature to determine how much of the $1.6 billion rainy day fund should be used.